Seagate® SkyHawk™ AI is the world's first, purpose-built drive for artificial intelligence (AI)-enabled surveillance solutions. ImagePerfect™ AI firmware for superior image integrity alongside additional AI workload support in always-on, AI-enabled surveillance systems. Custom designed to support an additional 16 AI streams while simultaneously and flawlessly recording footage up to 64 HD cameras. Improved reliability and reduced total cost of ownership with 2M-hour MTBF and 5- year limited warranty. 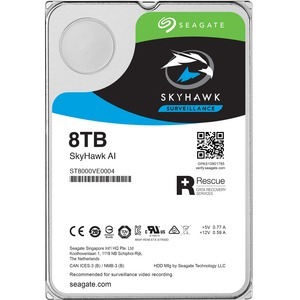 Unparalleled data protection with a complimentary 2-year Rescue Data Recovery Services plan bundled with every SkyHawk AI drive, providing access to Seagate's secure labs with industry-leading data recovery success rates.